I had the pleasure of living out the ultimate tween girl dream the other week by directing Annie and Haley LeBlanc from Bratayley and Paris and Isabel from Alexa and Katie in the ultimate best friend showdown! When I found out that Giver (Season 3!) was nominated for a Daytime Emmy I called my co-producer Rennata in a state of complete shock to figure out if it was real. Congrats to the whole team at Sinking Ship Entertainment on this and their other multiple nominations! What an honour for the little show that could with the help of thousands of great folks from around Ontario! Leeets Giver! So so so excited for Furze World Wonders to launch on YouTube Red! 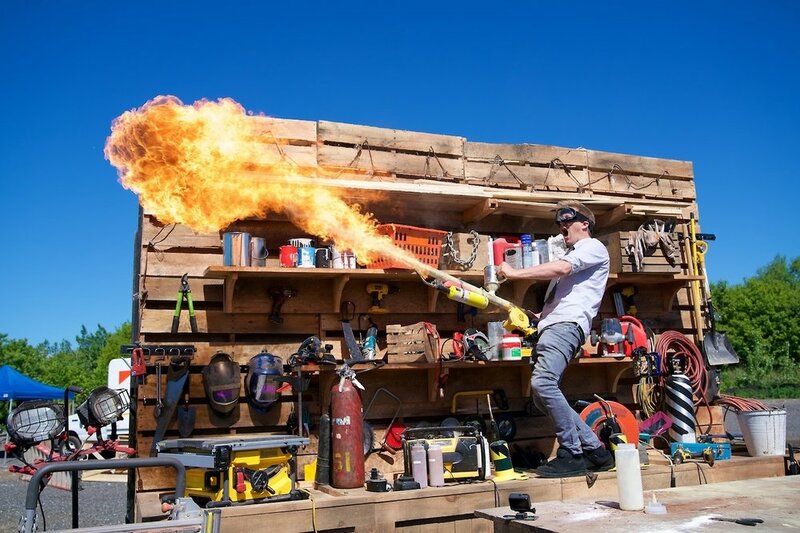 I spent a bunch of my summer working as a story producer with this incredible team to bring Colin Furze’s amazing videos to a whole new level- and as part of a 22-minute show! I’ll post more as we get closer! Math Styles- Episode 3! Use math to make an awesome hair net with this tutorial produced/directed by Jen and myself! Math Styles Episode 2! Check out how to make a spiral braid with this tutorial that Jen and I produced! We wanted this web series to show off how math and hair are related! Enjoy! Math Styles Episode 1!! Jen and I are so excited for our latest sweet little web series called “Math Styles” - combining math lessons in a hair tutorial style! <3 Enjoy! WOO HOO! Giver 150 (Season 4!!) launches today on TVOKids! I was lucky enough to direct three eps this upcoming season (BC/PEI, AB/SK and Newfoundland/Labrador) - and even got to do some construction on the mine play structure in the Northwest Territories section of the playground- lol. Chica’s celebrating with Mac & Cheese! So pleased to announce that our team at Sunny Side Up (Sprout) has been nominated for another Daytime Emmy Award (for Outstanding Pre-School Program or Series!) Excited to attend the ceremony and celebrate this incredible nod from our industry peers! Fantastic news! Giver and MathXplosion have been nominated for Awards of Excellence from the Youth Media Alliance! Big congrats to all who were nominated! New year… new DIRECTOR’S REEL! Check out all the fun children’s media I’ve had the fortune of directing over the past couple of years- all compiled together in 2 and a half minutes! Enjoy enjoy enjoy! Props to Kelly Noussis for editing, and Ryan Bernis for the graphic title cards! Got the opportunity to write this little piece for Sterling K. Brown. I was inspired by the many emotions he portrays on “This is Us”. Emotions are an actor’s best friend! Happy Halloween! Had so much fun making this trick or treating video with the team for our “Spooky Side Up” stunt! Awesome news! Look Kool (a show about shapes/math I developed with the folks at Apartment 11 and wrote for) is nominated for an International Emmy! Congrats to the whole incredible team!